There are two types of people in the world: Those who think Revolver is the greatest album ever recorded. Period. And those who'd tattoo the track listings from Exile on Main St. on their forearms in true rock and roll fashion. You're either in the Beatles' or the Stones' camp — even if you think they both have merit. Apples and oranges, you say? Well, one band has to be king. Or so the decades-old argument goes. Ain't life unkind? Brush your bangs across your brow straight and steady like Ringo's backbeat, or feather them out and rooster-strut down to the Arcata Theatre Lounge Sunday, Feb. 19 at 7:30 p.m. for Beatles vs. Stones - A Musical Showdown ($28, $25 advance), to watch Rolling Stones tribute band Satisfaction take on rivals Abbey Road in spectacular fashion. Both acts bring an authentic look and sound to their performances. The Beatles lads, rocking signature styles (Hard Day's Night-era suits, Abbey Road bell bottoms and Sgt. 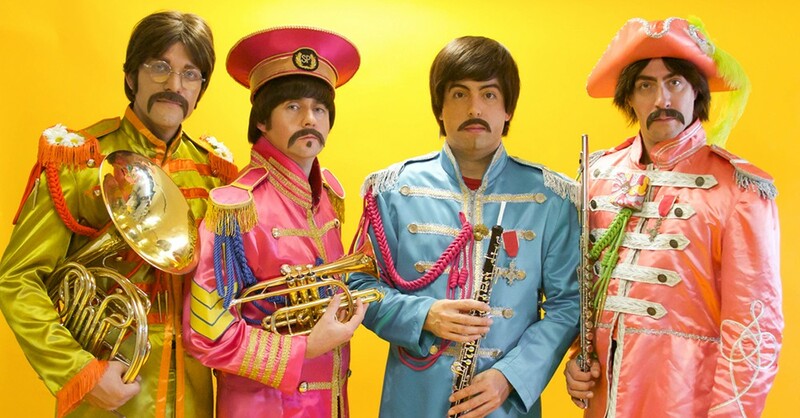 Pepper's wigs and moustaches), play modern reissues of the exact same instruments and amps used by the Fab Four. And Trey Garitty (Keith Richards) of Satisfaction says, surprisingly clearly, "We've done everything to present the music just like the original album versions, because that's what fans have been singing along to for the last 50 years and that's the way they want to hear it." Doctor please, some more of these. Mod or Rock. Pop or R&B. John or Mick. One reigns supreme. You be the judge.